Today in depressing auction news, a beaded, quilled hide shirt with white weasel fur fringe and human hair decoration worn by Nez Perce leader Chief Joseph sold at the Coeur d’Alene Art Auction in Reno, Nevada on July 21st for $877,500 to yet another anonymous private collector. This particular garment is of major historical significance. Chief Joseph was wearing it in the first photograph ever taken of him and in a painting by Cyrenius Hall that is now in the Smithsonian’s National Portrait Gallery. 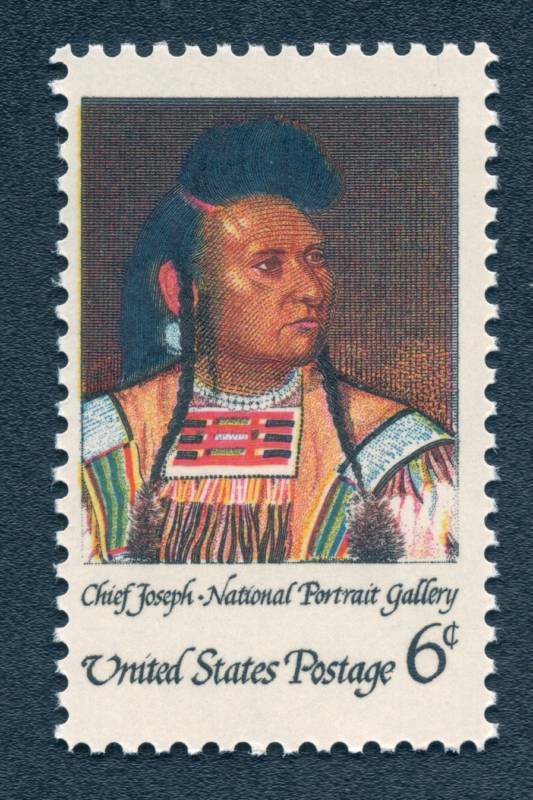 The Hall portrait was also used in 1968 to make a postage stamp dedicated to the great chief. The shirt was dispersed with the rest of his belongings at a potlatch — a ceremonial gift-giving feast in which goods both material and spiritual are redistributed and/or traded — hosted by Chief Joseph’s widow the summer after his death in September of 1904. 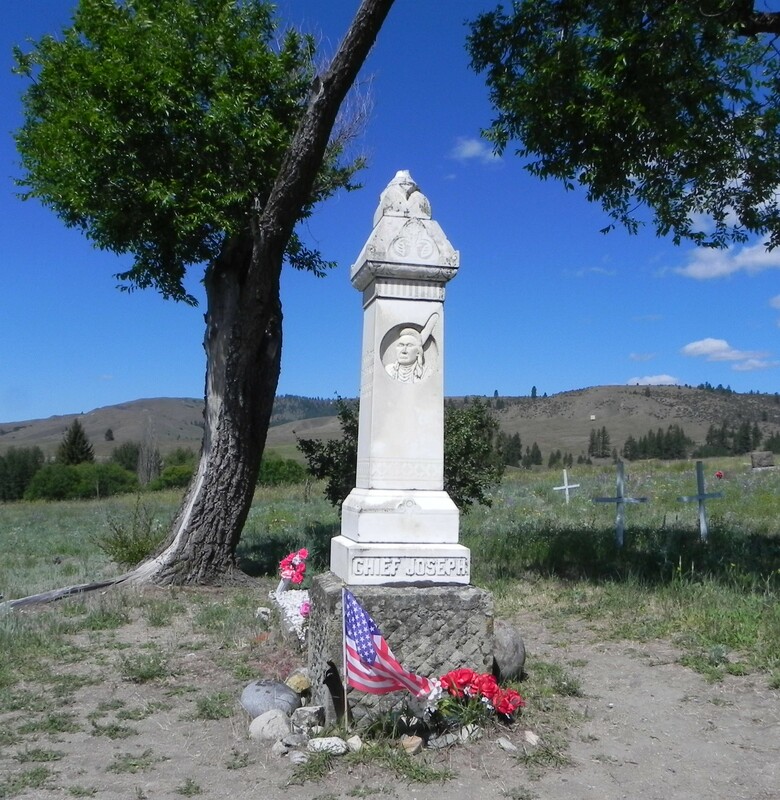 He had been buried immediately after his death, but in June of 1905, a white marble monument was erected to his memory in the historic Nez Perce cemetery in Nespelem, Washington. He was reburied under the new monument with great ceremony on June 20, 1905. The great war bonnets and war clothing went to the three nephews. A dozen watches were among the gifts, three fine guns and an endless array of blankets. One of the three buffalo robes was given to Three Knives, or Professor Meany. So presumably this shirt passed into the hands of one of Chief Joseph’s nephews in 1905, but there is no record of it after that for another 90 years. Its prominent presence in national iconography notwithstanding, the shirt disappeared into the market and was purchased by a collector at an Indian relic show some time in the 1990s. Neither the seller nor buyer had any idea of who had worn this shirt and when. It was sold purely as an exquisite Native American craft in excellent condition. That collector then sold it to another collector who researched the piece thoroughly and was able to identify it as the shirt worn by Chief Joseph in the 1877 picture and the 1878 oil painting. Experts confirmed that it could not have been a later forgery based on the images. The crafts and materials simply cannot be duplicated. Pictorial evidence is the best evidence there is for the provenance of an object like this. Another war shirt attributed to Chief Joseph sold at Sotheby’s this May for $482,500 because even though there was an impressive paper trail and oral history linking the shirt step by step to Chief Joseph’s cousin Peo-Peo-Tholekt who is said to have received it at the 1905 potlatch, there is no direct evidence that it was ever worn by the chief. One picture is worth a thousand words and $400,000, I suppose. The picture in question marks an incredibly sad period in Chief Joseph’s life and in the miserably awful history of the United States’ dealings with the Native Americans. In 1855, Joseph’s father known as Chief Joseph the Elder and a council of other Nez Perce chiefs signed a treaty with the US establishing a 7.7 million acre reservation covering traditional tribal lands in Idaho, Washington, and Oregon. Among them was the Wallowa Valley, the ancestral land of Joseph’s tribe. 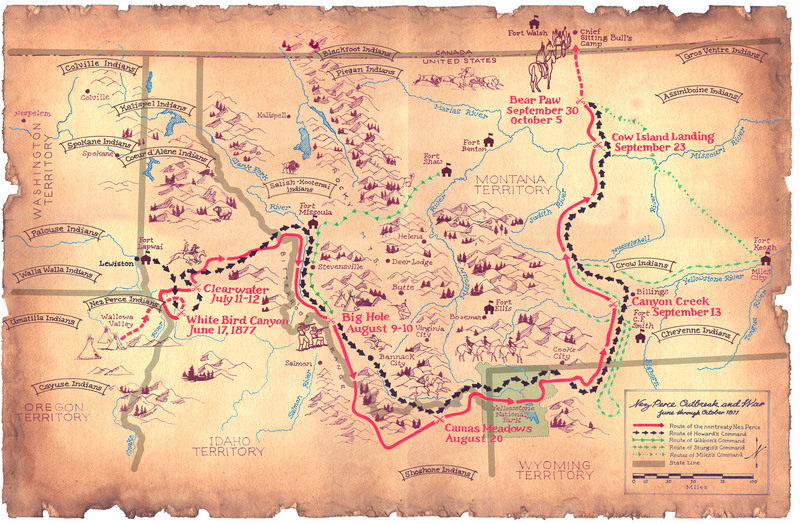 In 1863, under pressure from settlers and gold rushers, some of the Nez Perce tribes signed a new treaty establishing a 780,000 acre reservation which did not include the Wallowa Valley. Joseph the Elder refused to sign, as did other chiefs, this creating a rift between the “treaty” and “non-treaty” Nez Perce peoples. On his deathbed in 1871, Chief Joseph the Elder told his son “This country holds your father’s body. Never sell the bones of your father and your mother.” Chief Joseph promised. He never fought the white settlers or the US government with weapons and bloodshed, but he struggled at council after council to ensure his people remained in the Wallowa Valley. Treaties were made that were of course broken whenever the US felt like it. Finally in 1877, Army General Oliver Howard gave Chief Joseph an ultimatum: move out of the valley to the Idaho reservation or we’ll consider it an act of war. Joseph is seated in the photo and his hands appear frostbitten. Yet, his hair is pushed up in a proud warrior pompadour and he is dressed resplendent in his shirt. Examination of details in the photo leaves no question that the shirt in the Fouch photo is one and the same as the shirt here under discussion. 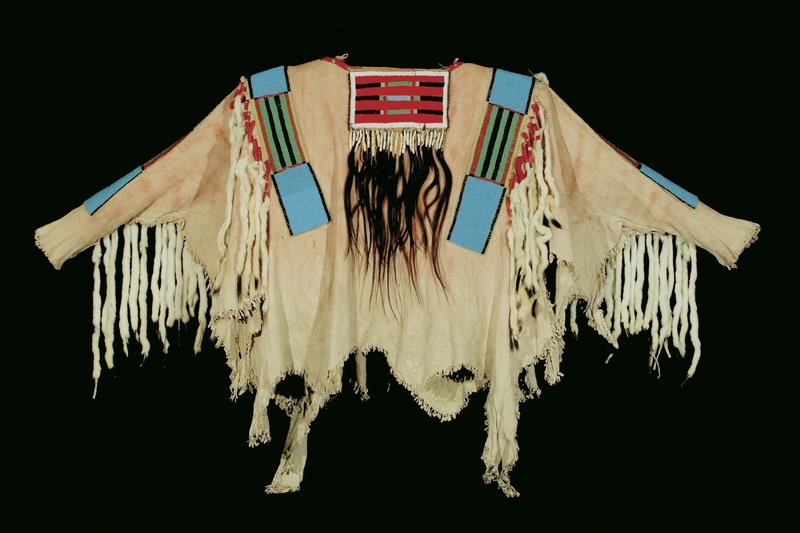 Note and compare the varying lengths of quill wrappings on the hair locks under the neck flap, the short fringe cuts at the end of the sleeves, and the alignment of bead decoration on the neck flap, shoulder and sleeve strips. (Color values of the orthochromatic film used in the 1870’s do not always appear as they do in the later panchromatic film.) Several of the red wool wrapped ermine skin fringes have been secured with pericardium and match up from photo to shirt, especially on Joseph’s left shoulder. After their stay in Fort Keogh, General William Tecumseh Sherman sent Joseph and 400 of his people to the prisoner of war camp in Fort Leavenworth, Kansas. 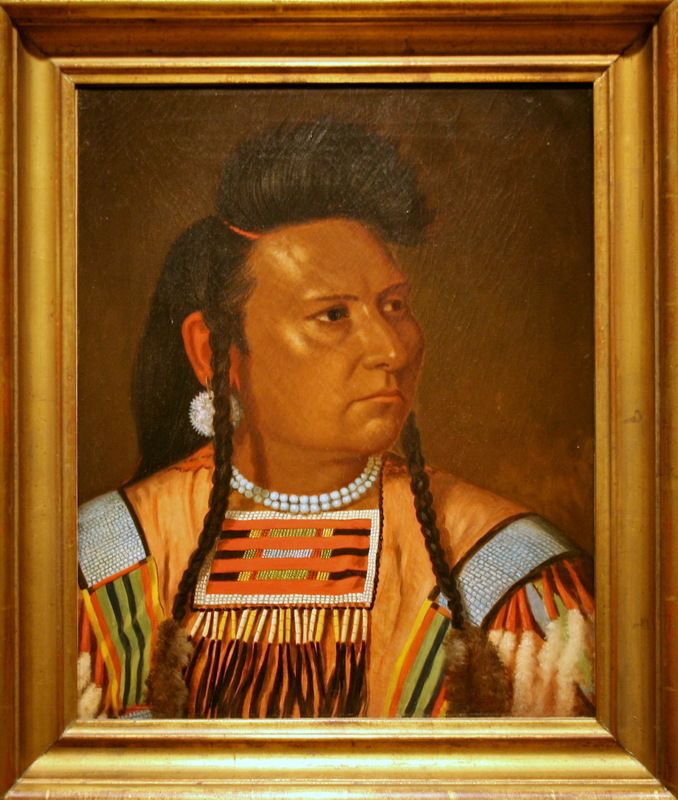 At Leavenworth, painter Cyrenius Hall made his portrait of Chief Joseph, again wearing the shirt. The Nez Perce were kept prisoner at Fort Leavenworth for eight months, then moved to Indian Territory in what is today Oklahoma. They lived there (in a manner of speaking; many died there) for seven years. During this time, Chief Joseph tirelessly fought for them to be allowed to return to their ancestral lands, personally pleading their case before presidents, politicians, intellectuals and in the press. Read his riveting account of the history of his people and the patronizing, stupid introduction to it in “An Indian’s Views of Indian Affairs” from the North American Review of April 1879. It’s enough to make you pop a blood vessel, I swear. In 1885 Chief Joseph’s Nez Perce tribe was allowed to go back to the Pacific Northwest, but not to the Wallowa Valley. 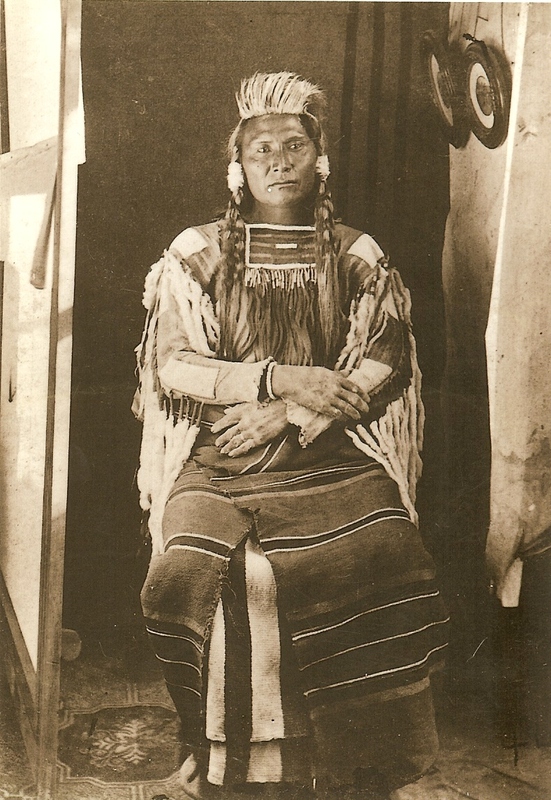 Even once settled in Washington’s Colville Reservation, until the end of his days in 1904 Joseph never stopped advocating for his people to be treated with reason and respect, and for their right to return to their ancestral homelands. This entry was posted on Monday, July 23rd, 2012 at 11:49 PM	and is filed under Modern(ish), Treasures. You can follow any responses to this entry through the RSS 2.0 feed. You can skip to the end and leave a response. Pinging is currently not allowed. I’m going to cross my fingers and hope that it was the Nez Perce tribe bidding through a proxy. At least I hope. I honestly have no idea how you could with a good heart and a clear mind keep something like this in your house. I think many of these collectors see these pieces as an aesthetic products first and foremost. The historical context enhances the value and fascination of the object, but it doesn’t put any kind of moral onus on them. It’s not a mindset I can identify with anymore. I did once, though, before I knew anything about the antiquities market. The good thing about it: We have no info so far on the hairstyle of the new owner. Besides, it is indeed a shirt worth fighting for and there is indeed plenty of room for more human scalp. The human hair on the shirt was cut, not scalped. Experts believe it was donated by people with an emotional and/or familial connection to the wearer. Quite a tidy sum. Nobody would be more amused than Chief Joseph himself. Sadly, the US government also outlawed the Potlatch ceremonies as a part of the decimation of native American culture shortly thereafter. The ban was lifted in the 1970s, I think. Was it a full-on legislated ban in the US? When I researching this post I found references to a US ban, but I couldn’t find an actual law. I found the Canadian one easily. Either way, formally or informally, these practices were deliberate and conscious attempts at ethnic cleansing, and disgustingly successful ones at that. This is correct; the Nez Perce always prided themselves on not warring with any other Indian tribes or even the white settlers until the war of 1877. In fact, seventy years earlier, the Lapwai band was notably mentioned by Lewis and Clark as having been of great help in their journey to the Pacific, and all Nez Perce were friendly to the white man since then. Young Joseph became a chief of the Wallowa band after the death of his father, Old Joseph, who never signed the 1863 treaty. A great schism between the “treaty” and “non-treaty” Nez Perce exists to this day. Chief Joseph mentions Lewis and Clark in his “An Indian’s Views of Indian Affairs” article I linked to in the post. He also explains that the French fur traders they met in the 18th century called them the Nez Perce and the name stuck even when the fashion for nose piercings was long gone. I didn’t realize the treaty/non-treaty dichotomy was still entrenched in the culture. 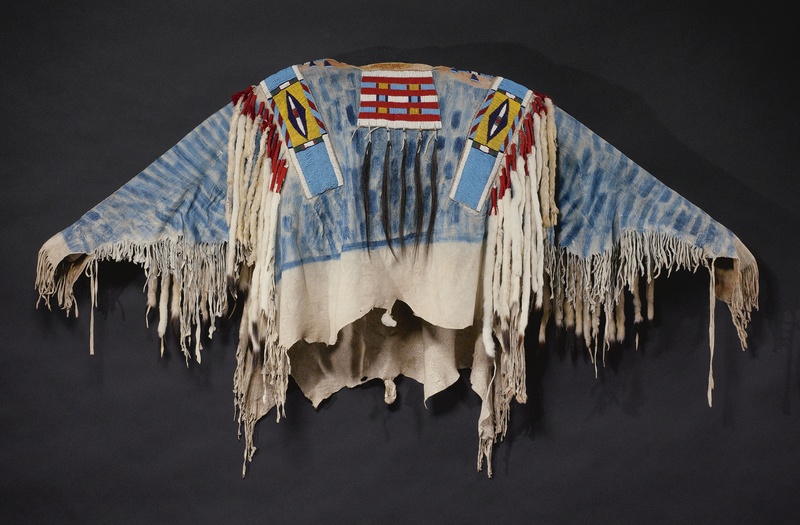 Chief Joseph’s War Shirt will be on display at the Yellowstone Art Museum in Billings, MT Dec 12, 2012. I enjoyed your post your careful research speaks eloquently. That’s wonderful news. I’m always afraid that these precious artifacts will disappear into private collections and never be seen again. I’m so pleased the war shirt is going on public display. Thank you!